I’d been waiting for the Mummys for a while and the excitement in the household was palpable. It was kind of like that week before Xmas when you were a child and you knew that the main event was only a matter of a few days a way… but every hour seemed like a lifetime. I’m always like this before any bit of kit arrives for review. Needless to say the usual courier nonsense got in the way and, rather than arriving on the Friday like the tracking details proclaimed, I would have to wait until Monday. Oh, the torment I was longing to give these things a slating as being all style over substance. It was a tough weekend where I busied myself preparing the listening room, moving out old loudspeakers and making room for the arrival of the sarcophagi. Monday finally arrived and just after lunch there was a knock at the door. Now, for this bit you need to cast your mind back to the Indiana Jones films and imagine a pair of wooden caskets being deposited in Harrison Ford’s sunlit and dusty office. I’d like to say that I’d dressed for the occasion with hat, whip and buckles to swash, but I hadn’t, all I had was my normal attire – yellow socks and a pink cravat (nothing lah-di-dah) and of course, in true action adventure hero style… a crowbar. The wooden boxes looked for all intents and purposes like I’d taken delivery of two small coffins… the mortal remains of a pair of child pharaohs perhaps. With my trusty crowbar in hand I jimmied the corner of one of the boxes and carefully moved around, slowly releasing the lid from the main body of the box. Laying there in stately grace was the tightly swaddled body of the loudspeaker itself. Carefully upending the coffin and sliding out the loudspeaker was a three man job, these are certainly no light-weights… and so to the cautious removal of the outer layers of the protective wrappings to reveal what lay beneath. With the clinical precision of a surgeon performing a delicate operation I began to make the first incision and within a matter of minutes the full glory of the Mummy was revealed. Standing about 130cm high and in stark white, polished poliglass (with carbon fibres no less) the Mummy is certainly awe-inspiring and definitely a design that stands it apart from pretty much any other loudspeaker I’ve either owned or had the pleasure of seeing. Carefully placed in the listening room the Mummy looks top heavy and ready to fall over, but the clever design of the base ensures that they will not tip over in any direction – handy as you would certainly know about it if one of these landed on you! 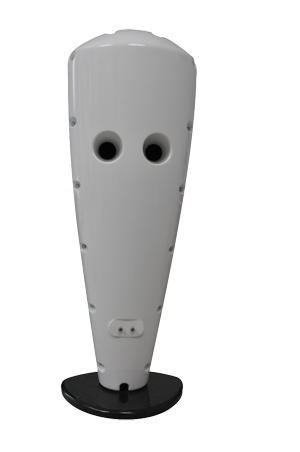 hORNS, the designer and manufacturer of the Mummy loudspeaker, is a Polish company who also make wave the FP10 bass reflex loudspeakers and the Universum front loaded horns. 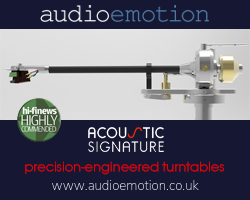 They specialise in creating all their products from poliglass using the same techniques used in building luxury yachts and if the finish of this particular pair of loudspeakers is anything to go by they finish to a very high standard indeed. The Mummy uses a 30cm (12”) driver that has a very low mass and large magnet to drive frequencies below 1800Hz and a compression driver coupled to a waveguide for frequencies beyond that. The enclosure is a heavily damped 75 Litres and is bass reflex in design, with two ports on the rear of the loudspeaker. A single pair of high quality binding posts is included and these easily accommodated the 4mm bare wires which I prefer to use over bananas or spades. They are 4 Ohms and 95dB and so should be easily driven by pretty much any amplifier you care to use. Now, I know that the visual impact of the Mummys is going to divide opinion, but let me say that everyone who has been in my listening room and seen them has commented on them being things of great beauty…if a little “different”. 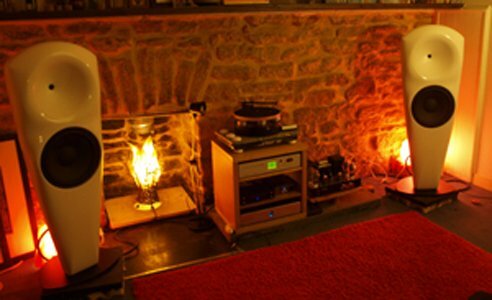 Personally I love the juxtaposition of the ultra modern Mummy against the somewhat rural look of the stone wall that is to the back of them in my listening room. I think they work very well from an aesthetic point of view and believe they will work well as a stand out piece in a more traditional environment, or indeed in a more contemporary living space. If you want shy, retiring and, dare I say, boring looking loudspeakers, then these are probably not for you I’m afraid. 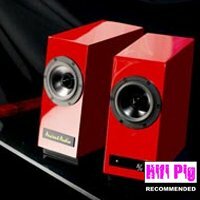 If you value modern design and are not afraid of having people discuss the look of your hifi equipment, then these will be right up your street. Who says hifi can’t look great/interesting anyway? I expected them to dominate the room completely, but given their tapered, top heavy shape they don’t. 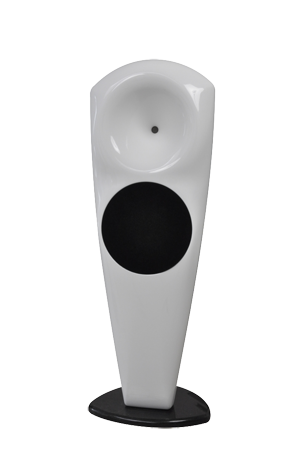 They are a lot less obtrusive than a traditional box speaker of a similar or even somewhat smaller stature and allow you to see around them, creating a feeling of space. Look, this isn’t a fashion or home décor magazine, but I know to some folks the appearance of hifi equipment is important…suffice to say I like them a lot and love the way they compliment the room in a “Wow, they look great! What the hell are they?” kind of way. Oh my lord, I’ve morphed from Harrison Ford to Laurence Llewelyn Bowen/Martha Stewart. I’ll let you into a little secret – I’ve placed rose coloured silk scarves over lamps behind the loudspeakers to create a nice and calming environment and better define the Mummys – it’s a bit girly, but creates a lovely space in which to sit and enjoy the sound of the hifi. Oh no, what’s happening to me? I’ve listened to a few waveguides and I’ve listened to a good few front loaded and back-loaded horns too and every time I sit in front of them I have the same reaction – there is a brief period of around 30 seconds where they just don’t sound right at all, as if something is missing, or perhaps something is dominating the sound. However, after this initial period of, let’s say, acclimatisation, everything simply falls into place and the Mummys are certainly no exception to this. After getting them into place, wiring them up and sitting down for a listen it was clear that the Mummys represent something quite special. 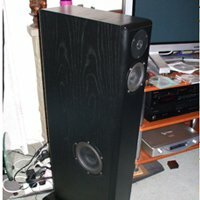 I was told by the UK distributor (G-Point Audio) that I should let them loosen up for a while, but from the outset it was evident that these were no ordinary loudspeaker. 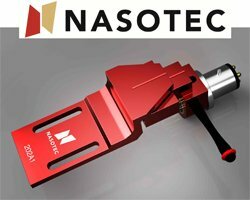 Of course, I wasn’t going to do any critical listening until they had a few days to shake off the constraints of stiff new drivers, but I was quite happy to sit and listen to album after album. After a week I thought they had had enough time and yes, the sound did open up a little more…as if they were breathing a little more easily…Tunes no doubt! Being rear-ported I expected there to be a degree of difficulty in placing the Mummys, but they seem to be pretty tolerant of a fairly haphazard positioning. The best position I found, and it wasn’t a particularly scientific procedure, was 50cm away from both side and back walls with a good degree of toe in, but I’m sure there is a lot more messing about and fine tuning to be had in this respect. The first thing that you notice is the soundstage – it’s huge and progresses beyond the loudspeakers left and right, as well as appearing behind them and well into the room too. You simply feel like you can walk in there and touch the music. There is both a great height and width to the soundstage. I fully understand this is a psychoacoustic phenomenon, but it’s a great “trick” and that feeling of a three dimensional ‘image’ being presented in front of you is very real indeed with this loudspeaker. ‘The Miseducation of Lauryn Hill’ by Lauryn Hill has an interesting theme running throughout the album – songs are interspersed with a recording of a discussion in a classroom and I found myself really drawn into the lesson. Every nuance of the classroom is there – the scraped chairs, the little coughs and sniggers of the pupils, but when the beats kick you know about it. The bass kicks are fast and taught with no flabbiness or overhang and the hi-hats are crisp and up there in the sky. Lauryn’s vocal style is at times restrained and you feel her holding it back, but when she lets fly you sense the full belt of emotion she brings to the tune. It’s gripping stuff and you can’t help but forget about dissecting the minutiae of what is happening and just go with the flow of the tunes. I’ve listened to a lot of hip-hop with the Mummys and they do the style very well indeed and this surprised me a great deal. I don’t do classical music at all…it’s all a bit ‘stately home’ for my liking, but I do have quite a few records I’ve collected over the last few years just in case I ‘grow’ into it. I thought it would be rude not to give the genre a whirl on the Mummys and so I reached for the “Concierto de Aranjuez” for guitar and orchestra by Joaquin Rodrigo with John Zaradin and the Philomusica of London. You know what, I think I may be on the turn! I loved it. We all loved it and stood gawping in the direction of the loudspeakers. The sheer scale of the thing and the feeling of (I know, I know) being there. It’s clear that the guitar has been close mic’d and you can here this – every little nuance of the guitarists playing is presented beautifully and the finger movement on the fret-board and across the strings is all there adding to the feeling. Dynamics, that’s the word I’m struggling to find! When the orchestra comes in you feel its power swelling, but the guitar never becomes lost or overpowered. Again this is powerful stuff! Dub reggae will be the Mummys downfall, I know it!! I was expecting dub-lite with non-existent bass and a boring presentation. I listen to a lot of dub reggae and one of my favourite albums is Dub Syndicate’s “Strike the Balance” on the On U Sound label. I was right and this is where the Mummys really fall down – the bass was light and it just didn’t sound right – dull and lack-lustre. However, crank up the volume a little and “Whooooaaaah!” Everything clicks into place and the drum and bass, the reverbs and the guitars sound just so right. Any more bass would have sounded overkill in my room and it’s not a small room by any stretch of the imagination. I’ve listened to this album hundreds of times and I know it inside out. However, I was hearing things I’d never heard before, small nuances of the mix that have previously been hidden to me, bits of reverb that had previously remained out of sight and a general feeling of “this sounds right!” A bit of a revelation! Note of caution – at low levels these loudspeakers do not play this genre at all well and they need a bit of welly to get the best out of them. I’m using 300Bs in PSE which give about 18 watts and I did find myself wondering what a big solid state amplifier would sound like with the Mummys…an experiment I will try in a few weeks time. Don’t get me wrong though, 18 watts is plenty and I barely ever had the amplifier turned up past 10 o’clock. I spent most of my late teens up to my mid thirties in night-clubs listening and Djing house and techno and I love this kind of music – it’s in my blood. Any bit of kit that wants a permanent position in my listening room has to pass muster with this genre and so I reached for Sweet Drop “Acid People” – a sparse and dark house tune on the Strictly Rhythm imprint. Again, like with dub, at very low levels it was a disappointment, but crank the volume a little (not a lot) and you are rewarded with a dark, low ceilinged, seedy and dirty night club with the tune pulsating and throbbing through the room. There really is a feeling of being in a club when listening to this kind of music – you feel it – not only on a physical level, but also in an emotional sense. I know this sounds like utter twaddle as I’m typing, but that’s what these speakers bring to the party and it’s another complete shock to me. Yeh, yeh I suspected they’d do jazz and classical stuff all very nicely, but these things doing dance music AND dub reggae was never on my radar. What a wonderful surprise! Ok, so the Mummy’s can do simple, they can do dub and they can do house and techno, but can they rock. Infectious Grooves “Sarsippius’ Ark” is a great slab of funk rock and I thought this would be a bit of a challenge for these loudspeakers, so into the CD Drawer it went. I like to listen to this kind of music loud, but never once did the Mummys become unsettled or feel like they were struggling with the music. On their cover of Led Zeppelin’s ‘Immigrant Song’ the opening bass line is delivered with an air of tension and you really feel the funk – it allows you to single out out every pick and every slap. Again the bass is never flabby, but is tight and controlled. It’s not trouser flapping and it’s not as visceral as I’ve heard, but it’s all there. On Pink Fairies’ ‘Kings of Oblivion’ Larry Wallis’ ‘big’ guitar soars around and above the bass lines and drums which provides a solid back drop and it all sounds …well… right. Here’s the thing. They are not monitors. They are not meant to be monitors. I actually found sitting down and listening critically to record after record really difficult. What was happening was I’d sit down with good intentions and a pad and a pen in hand, but after a short while I was just letting the music get on with it, enjoying it for what it was and I was rapidly losing concentration…getting lost in the music. I wasn’t trying to pick out instruments in the mix and point out where they were panned to on the desk. I was being entertained by the tunes in a way that I’d not been in a long time and isn’t that what our hifis are supposed to do? Now, I don’t think that definition goes far enough for the hORNS Mummy loudspeakers. Yes, they look fabulous (if you like that kind of thing) and they certainly give the impression of being hot, but that seems to disappear into insignificance when you sit and listen to them for extended periods. They offer a bewitching presentation that allows you to forget that they are there – a presentation that allows you to relax in front of them and be carried away by the music. What the Mummys do well in my opinion is they allow you to connect with the music on a very emotional level – they are easy going and just don’t get in the way of your enjoyment. 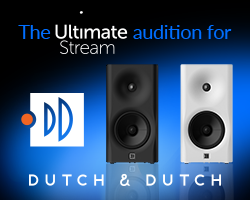 They are at their very, very best with well recorded, simple music and by this I mean live music recorded with the minimum of input from recording engineers at or after the event. On live, small-scale jazz they do have that feeling of ‘being there’ and give you a real insight into the space in which the recording was made. When listening to this kind of music, the Mummy becomes a tool that allows an intimate interaction with the piece – you can smell the cigarette smoke, you can feel people chatting around you and you can sense the atmosphere. Yes, that is the word…atmosphere! On laid back hip-hop you get a feeling of languidness that is at the genres heart – a stoned out feeling of lazy days spent in a haze of dope smoke. Time and time again I found myself reaching for music I’d not listened to in a very long time and some records I’d never bothered to listen to at all because I knew they weren’t ‘my kind of thing’. Bach’s Chaconne in D minor and Fugue in A minor with Narciso Yepes playing guitar sounded simply wonderful and I found myself completely taken in by the music…not listening necessarily, just letting the beautiful sounds wash over and envelop me. That’s not to suggest that these loudspeakers don’t do other genres or recording techniques well, they do. On rock they …err….rock and bound along with you tapping your feet and nodding your head in time with the music. On dub, reggae and house they bring something very special to the party indeed which was a complete shock to me! Are they compromised…of course they are! Show me a man who says any pair of loudspeakers isn’t a compromise and I will argue the case he is a liar! The Mummys don’t dredge the very lowest of bass notes from recordings, but they do ‘do’ bass very nicely indeed. It is tuneful and if I’m honest, as a bit of a bass-head, I didn’t find myself missing anything at all. There is a matching sub-woofer available, but I’m not sure I would bother, because what you get with the Mummy is a coherent and articulate loudspeaker that does so much right and the areas that it excels in make up for any foibles you may encounter along the way. One of the many things I loved about them was the tone they brought to instruments – ok I suppose this is a bit of an odd way of saying what I’m trying to convey and a better way would be to say is that the loudspeakers allow instruments’ individual tone to shine out – nylon strings on acoustic guitar actually sounds like nylon strings on an acoustic guitar and pianos, when well recorded, actually sound like pianos playing in a real room. 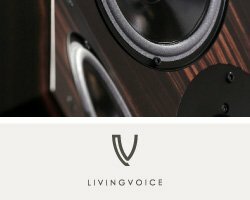 I’ve read this review back and it all seems a little gushing – the word “feel” gets used a lot, but that’s what happens when you listen to music through these loudspeakers – you forget about the world around you, forget about the hifi and begin to feel the music move you. Regular readers of reviews that I do will know that my ‘go to’ track is Songbird from the Rumours album by Fleetwood Mac and I’d made a conscious effort not to mention it in this review…. suffice to say you need to hear this tune on these speakers, it’s simply beautiful – haunting, full of emotion and crammed with atmosphere! With the right kind of music at low levels they are exquisite, but a word of caution should be mentioned here – with house, dub and techno you do need to crank them up a bit – but then who in their right mind listens to this kind of music at very low levels. With late night Jazz (and it would seem classical music too) a great deal of pleasure can be had from the Mummys and I spent a good few hours when everyone else had retired to their beds listening to tunes. I’ve gone through a lot of speakers in the last 4 years from some pretty well known brands and I finally settled on an ancient pair of Japanese Victor SX7s as my main loudspeakers. They are tatty and they are ugly, but I loved them and, like I say, they sounded better than anything I’d previously pitted them against. I don’t give a monkeys’ what a loudspeaker looks like, just so long as it performs well. Now the Mummys aren’t cheap at £5500, but in the great scheme of things, neither are they expensive. 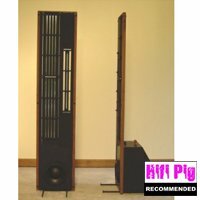 Do they offer good value for money…damned right they do and I’ve heard a lot more expensive loudspeakers sound no where near as good as these! It would seem that the Victors are now to be ousted from the listening room and the Yummy Mummys are most definitely here to stay. I’ll be uploading a couple of videos of the Mummy Mkii loudspeakers in action in the next few days. 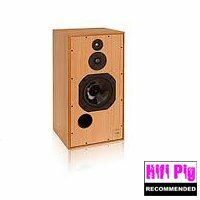 I should add that obviously these loudspeakers get the Hifi Pig Recommended award! 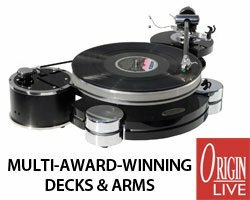 Review kit: Unison Research Primo CD, Wilson Benesch Circle Turntable, Modified Rega RB250, Audio Technica 33ev, Electrocompaniet ECP 1 phonostage, TAC 300 amplifier. I would like give my heartfelt thanks to you for that generous review. voicing as universal as possible had been really well done and worth. them back, but you also put them into limelight in truly meaning way. a way above usual speakers building skills and it passed all tests. 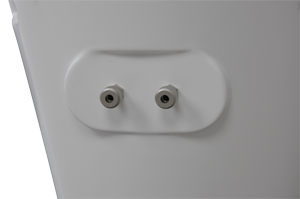 Thank you very much for taking your time to test our Mummy mkII speaker units. wise position on the rank and,what is more important, in music enthusiast’s one.